August is nearly upon us and I still haven’t achieved the sun-kissed glow of my dreams. I personally don’t like getting my skin all shrivelled on sub-beds, and I can physically never reach beyond my shoulders when using a self tanning mitt. As an exceedingly pale and freckly individual, I seriously need all the help I can get to become a bronzed beach goddess before my upcoming mates’ holiday. But where do I turn for my sea siren transformation? And – of course – how do I make it look natural? Luckily, good old Superdrug has your (absurdly pasty) back. And their novel solution is as cute as it is scrummy. 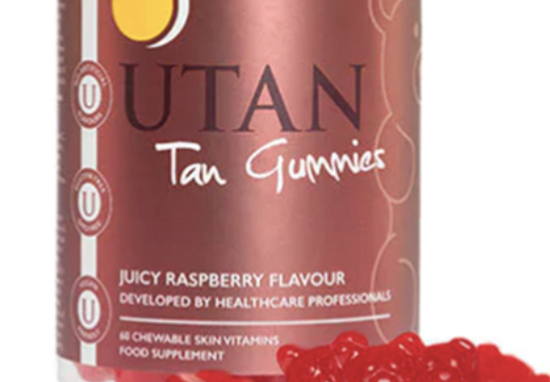 Sun Gummies have been developed by Company UTAN & Tone, and are intended to give you a sun-kissed look from the inside out, using vitamins, minerals and plant nutrients. Unlike many gummy products, these little beauties are suitable for vegans and are free from artificial flavourings. Best of all, the flavour is Apple Lemonade which is a dreamy summery taste if ever there was one. These little bears follow in the tiny footsteps of UTAN & Tone’s raspberry flavoured Tan Gummies, which are also available at Superdrug. Tanners should take two bears a day for about two to three weeks before hitting the beach. Once you’ve reached your desired shade of skin, you should start to reduce your daily bear intake. From the creators of Tan Gummies, another worlds first developed by healthcare professionals using tried and tested traditional ingredients. With copper for the maintenance of normal skin pigmentation; Vitamin E to help protect the skin from oxidative stress; Vitamin C to help with the formation of collagen in the skin & Zinc & Riboflavin to help protect the skin from oxidative stress. With any sun exposure an SPF is essential. Sun Gummies™ are not, and do not contain SPF. Vegan friendly. Gluten Free. GMO Free. No Artificial Flavours or Colours! My tan is honestly the best its been in years. My wife takes the tan gummies and seems to now swear by them, she does have a great tan. I just wanted something to accelerate the holiday tan and have done so with success at quite a reasonable price. They are also quite enjoyable to eat, I eat mine after meals to curb my sweet tooth. You can pick up a nifty jar of UTAN Sun Gummies for £17.99 at your local Superdrug store. A perfect addition to your beach bag.